He who does not imagine in stronger and better lineaments, and in stronger and better light than his perishing eye can see, does not imagine at all. Many wantons ... doe hunger after the earthie excrescences called Mushrums. Traders and trade in ancient Mayan society are subjects of intense discussion and debate in anthropological journals. Archaeologists such as Muriel Weaver (1952: 57) and William Rathje (1972) believe that without an integrated system of exchange, administrated by an astute managerial class, the Maya might never have achieved the lofty cultural peaks of the Classic Period. Trade and a trader class were essential if life was to carry on smoothly. The Maya traded most everything: salt, feathers, rubber, obsidian, flint, igneous stone, honey, cochineal, jade, wax, polychrome vessels and a panoply of other necessary and superfluous commodities of daily and ritual life. Ancient Mayas desired (and needed) these goods with a passion. An item of trade and a group of traders are presented in this article in the framework of a hypothesis: a model which involves the ancient Maya of Mesoamerica and their propensity to utilize and trade a unique commodity, psychotropic mushrooms. The aim of this article is not to rehash specious information concerning the significance that ritual hallucinogenic mushrooms may have had for Mayan peoples centuries upon centuries ago, but rather, to reinterperet the role and status of these sacred plants in ancient Mayan society. The "Transcendental Interaction Model" examines the phenomena of the proliferation of exploitable hallucinogenic mushrooms in Mesoamerica and the possible ways and means that prehistoric peoples utilized them; as well as discussing prehistoric mushroom effigy stones and other symbolic iconography. The model's fundamental components have been developed in response to Dobkin de Rios' inference (1974: 148) that "it is possible that psychotropic mushrooms were important trade items in the southern highlands, where active commerce with other parts of Mesoamerica existed." And also in response to Köhler's (1976: 145) skeptical comment that "none of the rather speculative hypotheses so far proposed offers a convincing explanation." Additionally, while Dobkin de Rios first mentioned the existence of a mushroom connection, she did not pursue the question of the necessity of that connection, given the sociocultural and political conditions of the time. The mushroom mystique of the ancient Maya is made more comprehensible in the context of ordinary, business-as-usual mushroom trade. To be sure, the Transcendental Interaction Model is a speculative hypothesis of ritual mushroom use derived from "limited inferences" (Plog 1977: 138) that archaeologists are able to make about ancient Mayan religion, society and trade patterns. It is also without question a somewhat radical hypothesis. Emboden (1979: 91), in discussing advances of historical knowledge, observes: "The structure of Mayan civilization may require new interpretations.... The burgeoning reports [of hallucinogenic practices] in recent times suggest that much of the history of the peoples of ancient Middle America will have to be rewritten in light of [material] previously unknown in the psychohistory of these civilizations." Several problematic variables are dealt with in this article which attest to the model's holistic and heuristic framework of understanding mushroom trade as cultural exchange. One variable is why a demand for different species of the genera Psilocybe, Stropharia, Conocybe and Panaeolus (and possibly, Amanita muscaria) would have been created by Mayan theologians. A second variable is how ritual and ceremony would have functioned at base organizational levels to manipulate and control sociopolitical and magi co-religious power. Another variable is how mushrooms, like any desired commodity in ancient Mayan society, would have formed the basis for part of (or would have been incorporated into) an already existing trade network connecting the great and small ceremonial centers of the day. A final variable is how well or satisfactorily the physical and ethnographic evidence for mushroom trade meets recent criteria for detecting or inferring its existence in prehistory. The physical criteria relate to Plog's (1977) crucial variables for documenting the existence of trade in the archaeologic record.1 The ethnographic criteria are discussed in the following section. The argument ascribes paramount importance to mushrooms in liturgical and curing/divining ceremonies. The viability of trading these sacred ritual artifacts is in documenting their importance as supreme power/prestige denominators. The approach of documenting the important place in culture of magic mushrooms is necessary. Unlike concordant attitudes on jade, obsidian, salt and polychrome vessels (ceremonial and utilitarian items accepted by knowledgeable people as performing useful social and economic functions in Mayan culture), some archaeologists, particularly Köhler (1976), maintain that prehistoric Mayas and other peoples did not religiously and supernaturally worship the notorious fungi in ceremonials. Thus, to dispute and eschew Köhler's reasoning is in the model's best interest. Millennia ago, a significant climatic change occurred and a postglacial wave of balmy temperatures regenerated new forms of animals and plants over the planet. The bountiful Americas offered human populations drifting down from Berengia (Late Pleistocene/Early Holocene land bridge linking Asia and North America) hundreds of plants to eat. The knowledge of which herbs were esculent and which were foul-tasting and poisonous probably was acquired during a trial-and-error period of indiscreet plant consumption. Questing for new and renewable food sources, nomadic gatherers foraged for plants that sometimes caused illness, sometimes nourished and sometimes killed (Emboden 1979: XIV). A few of the plants induced in users perceptual distortions so bizarre and bewildering (and probably pleasant) that they were at once exalted as "power" plants and as vehicles of transubstantiation. These strange plants - from barks and flower tops to fungi and cacti - assumed a socioreligious status (Furst 1976: 15) that escalated in importance as religious concepts and power hierarchies became increasingly complex. After Schultes & Hofmann 1979: 148-149. The archaeologic evidence for ritual mushroom use in Middle America is geographically distributed from El Salvador and Guatemala, westward to Mexico and up to the Gulf Coast. Temporally, they range from Preclassic (Formative) through Late Classic times (Mayer 1977: 19-30; Parsons 1974: 170). Furst (1976: 77) writes that "as long as 3,000 years ago at least the inhabitants of the highlands and the Pacific slope of Guatemala, as well as some of their neighbors, held certain mushrooms to be so sacred and powerful - perhaps even divine - that they represented them in great numbers in sculptured stone." When some of these odd sculptures were first discovered by Kidder, Jennings and Shook in a tomb at Kaminaljuyú, outside of modern Guatemala City, hardly anyone thought to associate the delicate Preclassic lapidary objects with the awareness-altering mushrooms which abound in Guatemala and Mexico.2 "Due to ignorance of their actual employment and significance," the stones have been variously interpreted as "idols, fertility symbols, phalli, moon gods, cosmos symbols, maize pestles, clay models, field markers for ball games and farming, stone tools and representations of temples" (Mayer 1977: 5). Only the interpretation of their significance as field markers holds water. Their phallic symbolism is clearly flaccid because: (1) genitalia portrayal in other Mayan art forms is abnormal (Why the concentration of erotica at Kaminaljuyú and not elsewhere? 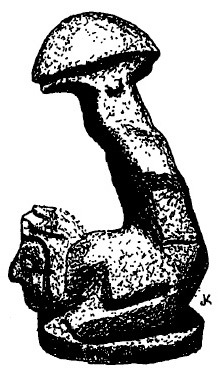 ); (2) they are one-sidedly male centered (Furst 1976: 80), which is contradictory to the general Mesoamerican trend of dualistic expression; and (3) they were found in association with manos and metates, for pulverization purposes, and not in association with sculptured vaginas or some other archetypical symbol of fecundity. No explanation sufficed for Kidder and his cohorts (1946) when the stones were brought to light as "peculiar and as yet unexplained objects." Eventually, the works of Wasson (1978, 1971, 1967) and de Borhegyi (1963, 1961) revised anthropological thought on this matter by unequivocally relating the stones in ceremonial symbolism to psychotropic mushrooms. Quite possibly, the carved objects were associated with the Mayan pantheon of night and underworld gods (de Borhegyi 1961). Two scholars have critically questioned the cogency and reliability of Wasson's and de Borhegyi's work. Köhler (1976) rejoined: "On what do the foundations of their interpretations rest?" He propounds a theory of practicality rather than ceremonialism; linking the sculptured stones to potters' molds. 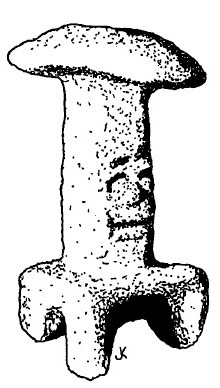 Apparently heedless of their uncanny surface resemblance to psychodysleptic mushrooms, Köhler bases his conclusions primarily on the disparity of artistic styles in the stones (see figures). Why are some fancy and decorated, while the majority are plain and mundane? Because of a preponderance of practical stones rather than ritual ones, which are effigiated and decorated, Köhler (1976: 146) argues that "there are no indications whatsoever that the mushroom has become a god in its own right." In Köhler's view, mushrooms were probably frivolous and unimportant in Mayan society, and only a few maverick priests may have dared to try them. Richard M. Rose (cited in Mayer 1977: 1) shares Köhler's pragmatic views. In a preliminary report in 1977, Rose stated that the mushroom stones functioned as "effigies of ball players and/or deities of the ball game... as forms used in the manufacture of the rubber balls used in the game." Although these interpretations may aspire to validity, refusal to recognize the stones as mushroom idols "is likely to be a function of R.G. Wasson's ingenious division of people with those who loathe mushrooms and those who like them" (Furst 1976: 80). Schultes and Hofmann (1979: 151) affirm that "whatever the use of these 'mushroom stones,' they indicate the great antiquity of a sophisticated sacred use of hallucinogenic mushrooms." Besides archaeologic evidence of carved mushroom stones, proto-Classic mushroom pottery and numerous stylizations of narcotic plants on bas-reliefs and monuments in association with deity figures (Emboden 1979: xiv), extant ethnographic parallels also refute the "negative evidence." Ethnographic parallels are useful tools of insight in understanding spiritual constructs of prehistoric peoples. Many groups remain documented case studies of unchanged cultural belief systems involving socially approved drug use to transcend daily life and to contact spiritual and supernatural worlds.3 La Barre (1970: 120) attributes atavistic rites flourishing in remote parts of Mexico as being "probably the closest extant to the pre-Columbian Mexican rite." Furst (1976: 75-81), Emboden (1979: 90) and Schultes and Hofmann (1979: 153) allude to mushroom rituals among Choi and Lacandon Maya peoples - supposedly in seclusion in temples at Yaxchilan and probably other inaccessible ruins. They concede that formal ethnographic verifications would imply origins of preconquest ritual, not modern introductions or diffusions from elsewhere in historic times. Furst (1972: x) goes on to say that "the present day custom may well have its origins in Classic or Post-Classic Maya ritual," although in a later publication (1974: 59-60) he amended the restriction that one cannot maintain such a view with certainty. The evidence for the ritual use of mushrooms in ancient times exists in archaeologic and ethnographic contexts. Although it may be subject to various interpretations, a deeper contention of the model acknowledges the cross-cultural and transtemporal importance of sacred alkaloid-rich plants. The Maya were not unique in their devotion and utilization of drugs as media of interpersonal and supernatural experience. In the following sections, sociopolitical and magico-religious parameters of pre-Columbian ritual mushroom use are defined and discussed in the context of trade. Sanctioned drug use as a means of achieving extraordinary mind spaces and prestigious status in the culture might well explain some of the architectural, scientific, spiritual, epistemologic, artistic and political "aberrations" of the ancient Maya. Groping for answers, Furst (1972: x) wrote: "Perhaps, as Coe suggests, the artist-priests of Palenque itself found inspiration for their magnificent creations in mushroom-induced supernatural visions." The cult of the mushrooms might have led to the development of interaction that better exploited the many rapidly perishable mushrooms in the mountains, forests and deer pastures of Mesoamerica.4 Trafficking in psychotropic mushrooms, though, was an activity of little economic benefit to the Mayan people. As with trafficking quetzal bird (Pharomachrus mocinno) feathers and jade, for instance, only certain people needed the product. The importation-exportation syndrome of exotic and local products is the crux of the "Core Area - Buffer Zone Model" which Rathje developed in the 1970's to account for the emergence of tropical lowland Maya civilization. Rathje (1972: 386) proposes that Maya civilization evolved "in response to the need for consistent procurement and distribution of nonlocal basic resources useful to every household." Networks sprang up and interaction took place. The networks required regulation and maintenance. A breed of crafty managers and keen organizers arose to direct the trafficking and dispensing of vital salt, obsidian and igneous stone (mushroom effigies are made chiefly out of igneous stone). Rathje believes the procurement and distribution of essential requirements of life ignited Mayan cultural evolution in the jungles of southern Mexico, Guatemala, Belize and Honduras. When applying Rathje's model to the procurement and distribution of psychotropic mushrooms, disparities emerge on two levels: (1) mushrooms were not the raison d'etre of Mayan culture (then again, neither were jade or brilliant trogon plumage); and (2) an underlying premise of the Transcendental Interaction Model (suggested by Dobkin de Rios [1976, 1974] and by Dobkin de Rios & Smith ) is that "every household" did not have access to ceremonial plants. An ordinary Mayan family probably had about as much access to sacred mushrooms as an ordinary family today has to a Catholic priest's holy waters. In elemental form, Rathje states that economic interaction (trade) was vital to meet the ancient Maya's subsistence demands, and that this presumed interaction caused Classic civilization to flower. The point is, mushrooms were not consumed for nourishment nor for anything so basic as physiologic survival and well-being. Wright (1974) makes it clear that other items exist and are traded as symbols of wealth or status and prestige. The procurement and distribution of mushrooms, then, was not motivated by "basic necessity" factors of the kind Rathje proposed, because mushrooms were never in the same category as igneous stone, salt and obsidian. Mushrooms, like other elitist ritual items, and unlike "basic resources useful to every household," were never prerequisites of cultural parturition. Other noneconomic motivations to trade must be discussed. A subliminal noneconomic motivation to trade mushrooms and/or other psychoactive substances comes from a thought in Andrew Weil's book The Natural Mind that applies to Rathje's scheme. Weil's intriguing hypothesis is that psychoactive plants are ingested out of human subconscious urges to alter normal waking perceptions.5 Weil (1972: 17) argues against economic and sociocultural motivations and conditioning to procure drugs: "The desire to alter consciousness periodically is an innate, normal drive analogous to hunger or the sexual drive." Furst (1976: 7) endorses this as a sound cross-cultural hypothesis, yet cautions that "for the present it must rest on circumstantial evidence." Examining Weil's hypothesis using Rathje's model, the pursuit of mushrooms with specific mind-altering tryptamines can be argued to be an inborn biological drive of the Mayan psyche to satiate certain basic psychological (primal) needs; just as the procurement of igneous stone, salt and obsidian was indispensable to the basic physical (elemental) needs of a civilization to develop. Although such an argument is highly abstract, Weil's ideas conveniently and logically relate the procurement and utilization of certain local and nonlocal mushrooms (Transcendental Interaction Model) to the procurement and utilization of certain basic resources (Core Area - Buffer Zone Model), in that the procurement and utilization of all four items (salt, stone, obsidian and mushrooms) conceivably can be viewed as an innate response/action to meet requirements of physical and neurophysiologies well-being. Another noneconomic motivation for trading mushrooms was sheer necessity, born from religious fanaticism and from ritual infatuation which governed vast aspects of quotidian Mayan life. Mushrooms were integral to ceremonies that functioned to contact spirits and seek extramundane knowledge. The plentiful species, valued for different perceptual effects, "acquired a deep and controlling significance in almost every aspect of life" (Schultes 1976: 56). The priests' divinatory enactments, curing ceremonies and other rites geared toward impressing the populace by performing suprahuman feats were ineffectual without transgressing prosaic normal awareness. Potent mushrooms were as indispensable and irreplaceable in certain ceremonies as were choice quetzal bird feathers and priceless jade in others. No ersatz commodities were substituted. If priests could not gain access to suitable ritual mushrooms, other recourses existed for transcendence. Schultes (1976: 65) comments how different species of mushrooms are utilized owing to "personal preferences" or to a specific "purpose of the use." Schultes and Hofmann (1979: 147-148) also assert that seasonal and regional availability influence choice of mushroom. True, these writers are not discussing trade and economics, but their ethnobotanical statements, per se, do support the possibilities of organized exchange to meet the supplies and demands of personal preferences, specific purposes, and seasonal and regional availability. 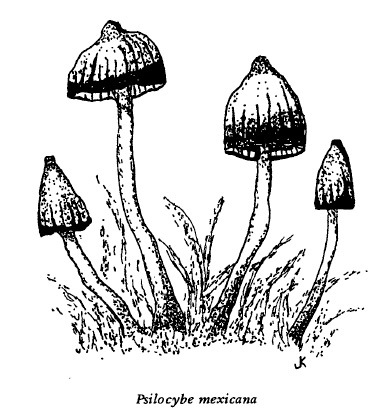 What does personal preference relate to if not to the tremendous selection in Mesoamerica of psilocin- and psilocybin-containing mushrooms which produce quite different physical, emotional and psychopharmacologic responses.6 In other words, in the field, one may not expect to find the same assortment of species employed at one time because different mushrooms grow in different places, and also because priests and shamans desired variation. Alternative states of perception appealed to priests and shamans who performed different symbolic roles in society; such as healing, predicting eclipses and divining weather for crops, looking into the past and future, and communicating with the gods and spirits. Another question is, how would the priests' choice of mushroom be decided; and why would one species be valued over another; and is it even true to assume that priests would have used diverse species? According to Schultes and Hofmann (1979: 52), modern-day shamans certainly enjoy variation: "Its use [Panaeolus sphinctrinus] by Oaxacan Indians along with so many other mushroom species demonstrates the tendency among shamans to use a surprisingly wide range of different mushrooms." An ethnobotanical look at the fungi is worthwhile. Psilocybe mexicana and Stropharia cubensis are two of the most coveted mushrooms in Mexico. Presumably, their spores of popularity germinated in prehistoric eras. The effects of S. cubensis are stronger. Between four to eight mg of its juice incite phrenetic gesticulations and afford brilliant, phantasmagoric images quite in contrast to the gentle, subtle and lucid visual undulations of Psilocybe mexicana (e.g., Furst 1976: 87). S. cubensis possibly, was a likely candidate for the priest interested in utterly transcending mundane surroundings to achieve instantaneous, perhaps mindless godhead. Psilocybe mexicana, on the other hand, was possibly reserved for less demanding ceremonies and enactments, where intense overpowering hallucinations, poor motor control and jumbled thinking would have impeded a rational and discerning equilibrium. After Schultes & Hofmann 1979: 144-145. Stropharia cubensis and Psilocybe mexicana are but two of at least 24 botanically categorized and chemically studied hallucinogenic mushrooms exploited in Mexico alone (Schultes & Hofmann 1979: 27).7 Native names are often indicative of apperceived inherent powers and qualities (Schultes 1976: 65). Etymologies may be traced to pre-Cortes times. Psilocybe caerulenscens var. 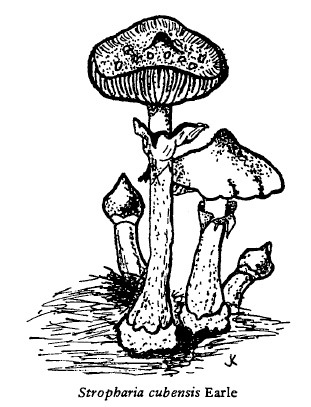 nigripes has as a mythological epithet, "mushroom of superior reason." Could it be that this name came about as a result of this particular mushroom's reputation for imparting insightful, intellectual visions? Priests who predicted the future or studied metaphysical relationships between celestial bodies and human existence - arcane tasks demanding accuracy and convincing results - might logically have turned to nigripes for superior reason. Other examples of names suggesting idiosyncratic preferences include: Psilocybe aztecorum, "children of the waters"; Psilocybe zapotecorum, "crown of thorns" mushroom; and Psilocybe semperviva the "always alive" mushroom for the ever-active priest. Dated sixteenth and seventeenth century Quiche and Cakchiquel dictionaries also are a source of etymologic clues relating psychedelic fungi to prehistoric culture. The Quiche word xibalbaj okox means "mushroom of the underworld" - the nether kingdom where dwelt the Nine Lords as described in the sacred Popol Vuh of the Quiche Maya (Furst 1976: 79). Was the ritual of mushroom ingestion widespread at a folk level? If so, the idea of everyone having access to unlimited quantities of mushrooms conflicts with and contradicts the idea of mushrooms as controlled commodities in limited access contexts. Perhaps incipiently, folk peoples utilized sacred fungi to facilitate and enhance supernatural contacts, but through time, as seen in Aztec imperial society, divine plants were usurped "for priests, nobility, and special guests of the empire" (Dobkin de Rios 1976: 41). With mushrooms abounding everywhere, a priestly litany of respect and fear kept the average person from picking them; so ultimately they could be used by specialists for "distinctive social goals" (Dobkin de Rios 1976: 41). A final question is, what would be the purpose of organizing mushroom procurement and distribution into a regulated network with many sociopolitical and religious ramifications? An overriding motivation to trade mushrooms in a noneconomic context undoubtedly lies in limited access to various species of mushrooms. This implies an abundant product of nature, constantly in demand but not always available fresh, and controlled by elites for the purpose of maintaining them in power. Although Dobkin de Rios (1974: 162) admits she quite possibly overstated her case, in a tightly regulated and controlled trade network her insights into mushrooms being "usurped by hieratic functionaries" (1974: 151) to maintain "legitimate power" are intriguing and make logical, legitimate sense. The priest with sacred plant power at his disposal could leave the mundane world, communicate with gods and spirits, fight demons and malefactors, and report back to his people unharmed and tenfold wiser. Such a personage would command utmost awe and respect. He would be a demigod, an interloper between mortals and deities. The prestige and power awarded to mushroomeating hierophants in Mayan society were status indicators of their commitments to perpetuate cultural traditions, maintain social values and ideals, and to seek beyond to unravel existential secrets. Only someone in a position of representing the people, however (someone like a high priest who was near totalitarian in power and influence), could experience the visions and contact the deific forces residing in the plants. Dobkin de Rios and Smith (1976: 264-265) remark: "Psychotropic plants ... are denied to commoners ... access to the plants became part of a reward system ... the Maya restricted psychoactive flora ... restrictions of drug use helped maintain the elite in power." Furst (1974: 154), on the other hand, rebukes this notion: "There is no evidence for a 'usurpation' of any of the hallucinogens employed in Mesoamerica by a priestly elite." Furst is right: there is no evidence for it, but there is also no evidence against it, save for Furst's words. Certainly, there were pleasure-god seekers who ingested mushrooms clandestinely, against the Sacred Order of Mushroom Awareness, but the vast majority of peasants was not iconoclastic. They must have respected or feared the priests' dicta that mushrooms were sacred repositories of divine power to be left alone at the risk of insanity, poisonous illness, weird and uncontrollable flights of the soul, and even death.8 It should be remembered how Catholics the world over once faithfully abided by the Pope's decree not to eat meat on Fridays. Like mushrooms in the hills after a rain, meat abounded in supermarkets on Fridays, but no self-respecting Catholic bought it or ate it. Most likely, sacred mushrooms "would be reserved for magico-religious rites and would not become the object of hedonistic bouts of abandon" (Emboden 1979: XIV) by either priests or peasants. Technically, it might be impossible to deny access to what grows wild, but apparently, for a while the peasants did anything their theocratic masters told them to do: witness the corvée erection of temples and courtyards into staggering ceremonial centers; the clearing of the land; the irrigation projects; and the toiling in the fields. It is not far-fetched to imagine priests telling peasants to stay away from sacred mushrooms, and the latter obeying. Furst, though, claims that "not even the police power of the modern state has been able to stop widespread recourse to forbidden substances" (1974: 154). Is one to believe, therefore, that no matter what fiats the theocrats issued, the peasants ate mushrooms? Furst fails to see two main distinctions between police power of the modern state and the politicoreligious power of the Mayan "loose federation of autonomous city states" (Thompson 1966: 97). One distinction is that police power in the modern state is not remotely derived from the powers believed by aboriginal peoples to reside in certain sacred biodynamic plants, and is in no way contingent upon their usurpation or monopoly in order to retain or maintain power.9 Secondly, Schultes and Hofmann (1979: 61) note a big difference between using "forbidden substances" today and in preindustrial societies where "plants are gifts of the gods, if not the gods themselves. It is obvious that our culture does not view hallucinogenic plants in this light." If our culture did, then perhaps tighter restrictions and controls would be placed on the use of such potentially power-laden artifacts. The priest who ingested sacred plants became one with the spirit in them. Transforming into an entity dedicated to reifying culture, not escaping from it (Furst 1976: 16), priests had little problem bringing peasants under their tow of politico-spiritual persuasion. Priests were seen as honorable, benevolent people worthy of extreme obeisance. Peasants accepted the absolute prestige and ultimate power of their priest-gods.10 Additionally, the mushroom eater in Mayan society could accrue prestige and wield inordinate power because of the magical endowments of mushrooms. Under the influence of Psilocybe mexicana, Psilocybe hoogshagenii, Stropharia cubensis or any number of potentially psychoactive fungi, priests could generate enormous power and respect in their roles. They could stage spectacular events for the peasantry, who could consequently only regard their theocratic leaders as suprahuman individuals on whom they bestowed rare apotheosis. Psychoactive mushrooms were potent instruments of transubstantiation in Mayan religion and ritual. They were social mechanisms for gaining power and accruing prestige, and they also served as "holy mediators between man and his gods" (Schultes 1976: 7). Thus far, the desired magical and sacred qualities of species of four genera of psychoactive mushrooms have been discussed in social and politico-religious contexts. Also, some noneconomic, infrastructural functional motivations for trading these various species have been discussed. Furthermore, the psychopharmacologic significance of hallucinogenic mushrooms vis-à-vis certain social imports has been underscored to show how such imports (power, status, honorability and prestige) resulted from exclusive indulgence in the plants, as well as to show how a trade network perforce would have evolved to meet supplies and demands for variable altered states of consciousness desired by Mayan priests. The accruement of social imports in trade situations falls under the rubric of "emulation" and complements this author's idea of trade, in that it "brings exotic prestige artifacts which confer status on those individuals controlling the supply" (Renfrew 1975: 33). The ritual use and importance of hallucinogenic mushrooms, a fundamental premise of the Transcendental Interaction Model, was more extensive and intensive in prehistory than in modern times. It should be remembered what the conquistadors did on learning of the "despised and feared form of plant life." In zealous campaigns of conversion and witch hunting, they forced shamans devoted to divine inebriants to conduct their pagan rites in the hinterlands. A few "refugee" peoples have managed to employ the sacramental plant up to the present day, but the ubiquity and fanaticism of the "mycophobic" Spaniards proved too overwhelming for most of the drug using, persecuted Indians. As Schultes and Hofmann, Mayer, and Furst have noted, at least from 24 to perhaps 57 different species are sought after in postconquest Mexico for important rituals. Was even more variation available before the cultural eradications of 1521 through the present? Presuming the most ideal conditions of a world view structured on the visions of hallucinogenic mushrooms, one envisions, in ancient times, a desired commodity with variably acting psychoactive alkaloids existing in dispersed abundance. These countless species of mushrooms were in as much demand among priests as was new and shiny obsidian among toolmakers, and rare, bedazzling plumage among elitist artisans. There was no shortage of variation either: the mushrooms' individualized psychopharmacologic natures made them nonhomogenous products; ergo, exotic to priests in different regions. Different species do occur at different places; from dead tree trunks and wet pasturelands to marshlands and decaying plant material (Emboden 1979: 89). These various, sporadically appearing mushrooms with their variable powers of perceptual enhancement created demands by priests to partake of more than just their few locally occurring varieties, which were limited as ritual, transcendent paraphernalia. Perhaps dozens of psilocin- and psilocybin-containing mushrooms existed and were used by the Maya and other peoples. Perhaps they still exist and have yet to be discovered.11 Schultes and Hofmann (1979: 148) are optimistic about this: "The probability that more species will be found in use is far from remote." The number of species in use before 1521 might have been phenomenal. Is it foolhardy to think of priestly elites trading back and forth this revered "plant of the gods"? Local and long distance trade of revered artifacts is evident in early cultures of Mesoamerica. Thin orange pottery from Monte Albán and Teotihuacán is found at Kaminaljuyú; glazed plumbate wares with Mexican deities occur commonly at Maya components; salt was brought in from afar; and renowned eccentric flints, which perhaps originated in Guerrero or western Mexico. Dobkin de Rios (1974: 148) conjectures that "trade in psychotropic substances may have occurred" in contiguous areas. Further convincing evidence for the trading of revered hallucinogenic artifacts is found in the appearance of an anthropormorphic gold "Darien pectoral" from Panama or Colombia at Chichén Itzá in Yucatán. Schultes and Bright (1979) arrive at the "inescapable conclusion" that these curious objects (over 150 exist in the Museo del Oro in Bogotá) represent the "religious use in prehispanic Colombia of intoxicating mushrooms." According to these two authors, and a number of other scholars, hallucinogenic mushrooms figured prominently in magico-religious rituals of aboriginal peoples all over the New World, including as far north as Canada and as far south as the Andes of Peru. Gold mushroom effigy pectorals, such as the one found at Chichén Itzá, along with mushroom stones, clay artifacts and stylizations on pottery were most probably items of long-distance exchange among members of prehistoric hallucinogenic-using cultures where artifacts were revered by shamans and priests as objects of deific, magico-religious devotion to mushroom spirits. The potential of real psychotropic fungi having made similar long-distance trips as items of exchange cannot be down-played. The genus Psilocybe, valued in Mesoamerica for species-variable psychoactive experiences, is also abundant in lower Central America and Colombia, with as many as 30 species reported (Schultes & Bright 1979: 121). Quite possibly dozens of species of Psilocybe mushrooms were traded back and forth throughout the ancient Americas. If the question is still, "Why trade mushrooms? "; then, one ought to now presume the most inauspicious conditions and circumstances in ancient times against setting up a trade system to procure and distribute desired variations of hallucinogenic mushrooms. Could not Mayan priests simply pick the local fungi they wanted at the moment? And then, would not a handful of local varieties satisfy demands for different hallucinatory (spiritual) experiences? The quality of local fungi probably did not meet demands for variable altered states, since many different kinds of mushrooms were needed; depending on current states of mind, types and purposes of ceremonies, and seasonal and regional availabilities. Furthermore, Mayan priests probably were not likely to go mushroom foraging in the wilderness. Other people, minions and devotees of the priests, collected and traded mushrooms as psychoactive variations of a desired transcendent state. Mushrooms were traded locally and even as far away, perhaps, as central and western Mexico and southern Central America. Long-distance exchange of hallucinogenic plants is entirely plausible, as demonstrated by the diffusion of peyote cacti (Lophophora williamsii) "far beyond the natural range of the plant into the United States and Canada, where Indians receive 'mescal buttons' by purchase from native Americans residing in Texas" (Schultes & Hofmann 1979: 134). Another contemporary line of evidence for ancient roots in the trade of psychoactive substances in Guatemala was supplied by mycologist B. Lowy (1977: 124), who reported that a local trade of psilocybin mushrooms was flourishing. Children were harvesting the fungi and were "offering them for sale to a clientele who traveled considerable distances to make their purchases." Besides these, other nonhallucinogenic mushrooms existed and were ritually consumed for divinatory purposes owing to peculiar, suggestive shapes; among them, Cordyceps capitata, Elapbomyces granulatus, Dietyophora phalloidea and two others, Clavaria truncata and Nevrophyllum floccosum (always in association with Psilocybe wassonii [Wasson 1978: 82]). And what of the many poisonous varieties which are capable of altering awareness? Weil (1980: 47) asserts that one can select over a wide range of toxicity and derive pleasurable and satisfying visionary experiences. This opens up a virtually infinite supply of mushrooms and a demand for their variable alternative states. The big question - the grand test of the viability of this reasoning - is whether or not all the mushrooms listed above occur locally and in equal distribution. If they do, then so much for local and nonlocal exchange of psychoactive mushrooms in the Transcendental Interaction Model. Schultes and Hofmann (1979: 147) point out, however, that it is just the opposite: "There may be years when one or more species are rare or absent - they vary in their distribution and are not ubiquitous." For example, there is definite limited access, intraregionally, to the species Psilocybe aztecorum and Psilocybe mexicana. The former grow only on the volcano, Mt. Popocatepetl; and the latter grow only above altitudes of 1,375 to 1,675 m (Schultes & Hofmann 1979: 151).12 Limited access to these and other mushrooms, including local varieties, provided a rationalization to devise an exchange system managed by elitist priests and their cohorts involving the transfer and flow of the commodity among priests of all areas of Mesoamerica. 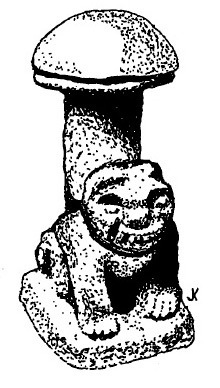 Stone carvings indicate that some individuals, possibly traders, were at Kaminaljuyú. Who is to say what they might have brought with them and were taking back to Teotihuacán and elsewhere? Polanyi's (1975: 136) criteria of trade, which must involve personnel, goods, carrying and two-sidedness, are met sufficiently in the context of ancient Mayas and other contiguous culture groups reciprocally exchanging psychotropic mushrooms. Mushroom exchange must be seen as intensive and intraregional. However, the idea of local exchange of mushrooms, which this author advocates along with distant exchange, conflicts with Rathje's idea of trade in a rainforest environment, in which he claims that all local exchange would be absent because of "ecological redundancy." This may hold true for most products exploited in a redundant milieu, where no need or exigency arises to trade them, but hallucinogenic mushrooms were exchanged locally and distantly because they were not a redundant product. Their individual protean visionary powers were avidly prized by priests. If mushrooms were available locally, Polanyi's (1975: 136) definition of trade as a "method of acquiring goods that are not available on the spot" conflicts with a basic premise of the Transcendental Interaction Model. Mushrooms were available "on the spot" for the Maya, but mushrooms of one area may have afforded different visual experiences from those of a contiguous area; or some from a land beyond may have been desired because they affected motor movements and coordination; while others which might have occurred in a ubiquitous habitat may not have even been available owing to rainfall variations, perhaps, or to a decrease in the local deer population and the necessary excrement on which certain species grow. For these reasons, as well as the individual preferences of Mayan holy men, the supply in one area did not necessarily meet the demands of that area. Renfrew's Law of Monotonic Decrement (1977: 85) states that some places "will receive less of a commodity than its neighbors nearer to the source." This is true in the context of the Transcendental Interaction Model, only in as much as it was a variation of a specific commodity and not the commodity itself which decreased in frequency the farther one got away from the source of a desired species of mushroom for a particular enactment. In other words, all priests had access to mushrooms (the commodity), but the desired variation of the commodity may sometimes have been absent or disproportionate because of distance, weather, idiosyncratic preferences and other related factors. Trading for goods that are not available on the spot (for example, different species of variably acting mushrooms) would evolve logically and inevitably into an activity of extensive/intensive transference of a commodity in demand because of desired variations in visionary experience. Dobkin de Rios (1976: 73), citing R. Blum, notes that the "more complex the society the more [one] can anticipate internal variety in drug use." Schultes and Hofmann (1979: 52) indicate the variation that shamans and priests desired. According to Polanyi (1975: 144), the basis of procurement depends on the exigency of the products as functional and desired items in society; and also on the "difficulty of acquiring and transporting" the products. What sorts of problems, if any, might Mayan harvesters and traders have encountered in acquiring and transporting a rapidly perishable product like psilocybin mushrooms? Would they still be valued in a state of putrefaction? If serving rotten and foul-smelling mushrooms on the altar/platter of a ritual enactment was blasphemous, no priest would have settled for anything but fine mushrooms. But if mushrooms pop up and die as ephemeral creations of nature, how could supplies and demands possibly have been met? Agaricaceae and Strophariaceae plants do not have to be immediately transported or consumed. They may instead be preserved; and ingestion of a dried form was common. The manos and metates found in conjunction with mushroom stones, together with certain mural depictions and wide-ranging ethnographic parallels, all suggest this. Artificial dessication, however, has a tendency to alter the taste and potency of the product. Freshly picked mushrooms yield a psilocin and psilocybin content of about 0.03% of total weight, while dried specimens have a more concentrated 0.3% of the psychoactive principles (Schultes & Hofmann 1979: 23), since the weight of water and other organic matter evaporates. Although the alkaloids in mushrooms appear not to be water soluble, the amount of psilocin and psilocybin in fresh and dried mushrooms is not constant. Generally, the drier the specimen, the less potent it is. If many priests were using dried material, they would have needed regular and reliable access to more mushrooms than required when eaten fresh. If the percentages above are somewhat constant, dried mushrooms still might have been preferable since the bulk weight of ingestion would be reduced ten times. The alternate state of consciousness induced by dried specimens still was highly valued by priests looking for the "overall desirable qualities" mushrooms afforded. Also, by drying the product and preserving it for later dissemination, supplies could be met in areas where certain mushrooms were out of season, exceedingly rare or nonexistent. The mushroom trade model conforms to Polanyi's view of trade: goods were available and obtainable locally and nonlocally; they were exploitable on the spot, in several hours or days later; and the only discernible defects in the product were altered taste and reduced potency. The reduced potency, however, implies a scarcity of a more powerful variable product, and therefore a staging ground for an ideal market in which large supplies of ritual brand dried mushrooms were exchanged. The Transcendental Interaction Model derives cogency and unity from supporting research and comments by numerous scholars pursuing eclectic information.13 The documentation by botanists, chemists, anthropologists, medical doctors, archaeologists and mycologists of the importance of hallucinogenic mushrooms in preliterate societies affords comfortable margins in extrapolating their pervasive role in prehistory.3 A contingent argument of the model is that ritual/hallucinogenic/transcendent/curative and other ceremonies were much more pervasive and important in autochthonous cultural tradition before the arrival of Europeans in the early sixteenth century; and considering the zealous and phobic way the Spaniards set about denouncing and expunging hallucinogenic practices among Middle American cultures 450 years ago, it is astonishing that any practices at all involving transcendental ritual have survived the inquisitorial centuries. Up to now, the model has been mainly concerned with noneconomic reasons for the reciprocality of exchanging variable fresh and preserved supplies of necessary hallucinogenic mushrooms. It is important now to consider plausible mechanisms and systems of the hypothetical mushroom exchange network. What was its structure? What groups or people traded and controlled mushrooms and toward what social, political and religious ends? How did mushroom trade figure in to an overall cultural matrix of events and relationships? The focus of the first part of this section is on reciprocity. Many ritual artifacts were reciprocally traded by the ancient Maya, and the subliminal implications of this particular style of trade for the elites of society who made it work, enhance the idea of mushroom exchange. Wright's (1974) statement that "trade facilitates the exchange of ideas as well as of material commodities," synthesizes quite nicely the point that no matter how important sacred mushrooms were as material ritual items, they were equally important as sources of new ideas, insight and cultural input. Mushrooms may have been de facto items of exchange, but that aspect was only half the purpose - the overt half of what was being traded. Acquiring mushrooms and trading them locally and nonlocally created social bonds, or an interaction sphere wherein thoughts could be shared, information relayed and friendly relations stabilized. Using Sahlins's (1972: 194) threefold classification scheme, a "balanced" system of reciprocal mushroom exchange wins out over "negative" and "generalized" systems (and over any other mode of substance exchange) because balanced reciprocity "refers to direct exchange." Additionally, Sahlins (1972: 195) believes that direct exchanges are socially and economically advantageous because they "stipulate returns of commensurate worth or utility. "14 Thus, Party A, dealing in mushrooms, might not have reciprocally received from Party B the equivalent in psychoactive material, even though Party A might have been in the market for a variation of that necessity. Direct exchanges, then, might have involved mushrooms for jade, quetzal bird feathers or aesthetic polychrome wares, since these and other commodities in ancient Mayan society represented exotic ritual returns of commensurate worth and utility. In one way or another, status, prestige and power were derived from or were affiliated with each item mentioned above. Sahlins points out the relative unimportance of the actual trade item by stressing the importance of egalitarianism in trade. When trade takes place as an "equitable exchange of different necessities" (Sahlins 1972: 220), the result is social harmony and well-being. Hallucinogenic fungi as items of exchange in prehistoric Mayan society may have played a role in structuring relationships. If five sacks of Psilocybe yungensis were traded for two sacks of Stropharia cubensis, or if three lapidary objects of exquisite jadeite were traded for a beautiful eccentric flint, it would be egalitarian reciprocity. Now, what if Party A attempted to upset the harmonious balance of exchange by offering inferior mushrooms for superior ones, or fool's jade for the finest obsidian blades? Would not relations among groups of people become soured and disrupted by inequitable exchanges of different necessities? The procurement and distribution of essentials often leads to conflict in exploiting and trading them. Consider, for example, the possibility of a shortage of mushrooms, for whatever reason. If religious and political power went hand in hand, as they did in the defunct theocratic civilization, imagine the ramifications if priests in certain areas were deprived of locally occurring varieties of hallucinogenic mushrooms - the all-important artifacts of power and prestige. Or, better yet, imagine the ramifications if priests - certain disliked, recreant ones - were purposely deprived of locally and nonlocally occurring mushrooms by a power coalition of elitist priests. Is politico-religious dependence so far-fetched? Although no single Mayan site is believed to have been more powerful or influential than another, Culbert (1974: 74) demonstrates the existence toward Late Classic times of regional states. Bird Jaguar and Jeweled Skull were two powerful leaders who vied for politico-religious prominence. Can the satellite relationships between certain smaller and larger ceremonial centers, and between some Mayan centers and distant cultures like Teotihuacán or Monte Albán, be interpreted as politico-religious dependence? Or, at least, can it be politico-religious control owing to asymmetry of resource flow? Trade as balanced reciprocity gave Mayan priests an inexhaustible supply of dried and fresh mushrooms from all over Mesoamerica.15 In idealized form, balanced reciprocity always ensured a continual flow and influx of essential, desirable commodities. Concomitantly, and perhaps more importantly, ideas were exchanged and relations among the politically polarized but culturally knit Maya (Weaver 1972: 154) were affirmed and enhanced. The Transcendental Interaction Model is viable because it is in harmony with what knowledge is available on contemporary and extinct societies, early trade patterns and presumed politico-religious importance of hallucinogenic substances in ancient cultures. Verifying the existence of exchange systems in prehistory is, for the most part, like trying to verify or divine something in the future. In either respect, clues and data are often nonexistent. Although it is permissible to concoct situations and theories which logically and conveniently meet Plog's (1977) most demanding conditions for verifying trade, hard physical evidence is lacking for a more rigorous analysis and therefore a more scientific treatment of his criteria. The commodity of trade discussed in this article is a perishable one. So were textiles in most early cultures, and definitely in Mayan culture. But who is to say if they were or were not traded? Ritual mushroom worship has survived the ages only in the form of happenstance discoveries of sculptured stones and pictographic representations on walls and codices. There are historical chronicles relating the use and importance of psychoactive plants in preconquest cultures, bequeathed to Western knowledge by Spanish friars and Jesuits who reviled their deific powers as paganism, idolatry and insanity. There are also elusive and ambiguous ethnographic descriptions of some Mayan peoples in Chiapas conducting rites with hallucinogenic mushrooms, but no one has concretely documented the veracity of these reports from the 1970's. Otherwise, nothing relevant to paleomycologic studies exists. The trade analyst working with jade, obsidian or pottery at least has a modicum of the actual item exchanged, and thereby can run chemical characterizations and study it in precise detail to determine exact origins and learn more fully its functions and ritual nature. This cannot be done with centuries-old commodities that have been ritually consumed and only infrequently memorialized in stone, painted murals and in latter-day vestiges of preliterate ceremonials. Besides serving as agents promoting social worth, value and respect of tradition, hallucinogenic plants have always figured in mystico-religious quests for power and knowledge in human cultures around the world. For millennia, they have been exploited, utilized and worshipped for their amazing properties to alter reality and create access to worlds beyond: to the "wilderness of mind," where one is able to "celebrate or contact the realm of the supernatural, to heal an illness, diagnose its cause, divine the future or to promote social solidarity ..." (Dobkin de Rios 1976: 73). The Transcendental Interaction Model's primary contribution to ethnobotanical knowledge has been to place exploitation, utilization and worship of psychoactive mushrooms in a specific context. This trade model does not impute any etiologic significance in the rise and fall of Classic Mayan civilization. Rathje's hypothesis of procurement and distribution of essential daily requirements and what might occur in cases of massive deprivation is insightful and could be a correct assessment of what caused Mayan civilization to flower, and conversely, what effected its downfall. In a class with several other psychoactive florae employed ceremonially by ancient priests and shamans in Mesoamerica, mushrooms assumed an integral role in the infrastructural continuity of Mayan religion and ritual; and not in the macrostructural continuation of Mayan civilization. A culture absolutely dependent on psychopharmacologic substances for its well-being and survival is extremely anomalous. No drug has ever been so all-important as to actually create or destroy a culture. No culture in recorded human history has ever been dependent on drugs for basic survival, even though a huge pharmacopoeia pervades all levels of ritual and traditional life. Dobkin de Rios (1974: 162) remarks: "I do not wish to suggest that we can reduce all of Maya culture to a series of drug-induced input." For certain, this is not the point of her work in the field; nor is it the point of the Transcendental Interaction Model. Hallucinogenic mushroom consumption was only an aspect of a vast mosaic of drug and nondrug ritual activities of the Maya. Of course, it is folly to think of these aboriginal people as perpetually intoxicated on narcotic plants, and to attribute all creations and innovations in art and technology to their recondite powers. Still, because of profound drug use and abuse in modern society, it is unwise to lose sight of the importance and respect that sacred plants assumed in ancient societies. The intention of this article has been to highlight a specific context in which ritual hallucinogenic mushroom procurement, utilization and worship can be placed in ancient Mayan society. For some, it may come as a welcome attempt to structure the use of mushrooms into a contextual framework and to deal in depth with a subject in Mayan ethnology whose importance has been underplayed too long. For others, years may pass before the Transcendental Interaction Model is firmly rooted in the ethnobotanical reality espoused by growing ranks of serious mycophiles. The author would like to thank Marie E. Ceccanese for her input of ideas and wealth of humanistic anthropological common sense, and especially for her patience, support and courage; Oscar Chamberlain for his editorial skills and heuristic sensibilities; Dr. Haree Deutchman for legitimizing and endorsing the initial research proposal at Indiana University in the spring of 1979; Professor Marlene Dobkin de Rios for her contributions and refinements; Jan Kearney for her beautiful pen and ink renditions of mushrooms and mushroom stones; and R.C. Rosenbalm for an unremitting interest in the project. Plog's "particular characteristics" cannot be avoided in a discussion of trade in ancient times. Besides not varying with investigative problems, "it is unlikely an investigator can accurately model exchange networks without attention to the characteristics" (Plog 1977: 129-130). Since Plog's approach is a technical aspect of the trade model, which mainly interests archaeologists, a specialized discussion of his variables as related to psychoactive mushrooms is not in order here. In any event, in archaeologic trade records - be the item of trade pottery, stone or jade - Plog's (1977: 128) query about "What should one try to learn of the organization of this network?" is difficult, if not impossible, to answer. Unless all the variables are satisfactorily accounted for, the documentation of trade should be presented as only a logical and viable extrapolation of conceivable events in prehistory. 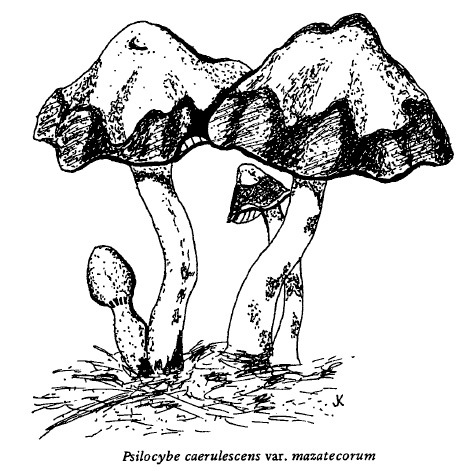 Mayer (1977) blatantly contradicts himself on pages 3 and 5 by first saying that mycologist Bernard Lowy (1977) found Psilocybe mexicana in Guatemala, and then claiming an "apparent absence" and also that "none of these exist in Guatemala." Köhler (1976) is another who seems to believe that psychoactive mushrooms are not found in Guatemala. A consensus of experts cited in the references of this article indicates otherwise. No matter how traditional in application ethnographic analogies may be, they never directly reflect bygone cultural activity. To reconstruct past civilizations accurately, all data are needed: not merely a sprinkling of artifacts and ecofacts; not primarily epigraphic attempts to decipher baffling stone inscriptions; not chiefly ruined ceremonial centers and ancient middens and sumptuary tombs, but every minute datum. All the data are never amassable in any field or project, but the few data that are available provide for logical inferences and viable extrapolations or constructions (also, divinations [Thomas 1974]). Construction of possible mushroom connections does not connote the specious accuracy of detail and truth that reconstruction does, which should be dismissed as an archaeologic misnomer. Peter T. Furst (1976: 172-173) speculates that certain species of mushrooms which grow only in cow manure in modern Mexico, and therefore unavailable in prebovine America, might have flourished anyway in the dung of another ruminant, the deer, which figured prominently in Amerindian aboriginal peoples' symbolic and mythopoeic concepts of nature and nagual animism. Furst connects the sixteenth century prohibition by Mazatecs against the killing of deer (and the meaning of their name, "People of the Deer") to an "easily observable relationship between deer and their [Mazatec] preferred sacred psychoactive mushroom." Dr. Weil hastens to add that while reality altering is a desired, worthy and socially approved means of exploring beyond mundane consciousness, it can be achieved with or without the aid of psychoactive plants and animals. If trade routes were severed and all hierophants were suddenly deprived of consistent supplies of hallucinogenic mushrooms for ritual enactments, an absence or paucity of the commodity probably would have had little social and economic repercussion; for numerous recourses to altered states of reality existed. A disrupted trade network might just signal the end of a mushroom connection. Yet, with other trade items (for example, Rathje's basic necessities of salt, igneous stone and obsidian) an absence or paucity of the commodity might well have resulted in a calamitous breakdown of systems. Set and setting (individual moods, cultural contexts, societal expectations and milieu) certainly modify the pharmacologic effects of a given substance in a particular ambience (Weil 1980: 3), notwithstanding different chemical reactions in the brain and central nervous system. It would be highly speculative to talk about perceptual alterations on a chemical level, but having diligently experimented with several species in varying dosages, and in identical and removed environments with and without the same people (both Western and non-Western), this author feels that at a subjective level it is safe to conclude that the central excitation of his nervous system was qualitatively altered under the influence of different and identical species of hallucinogenic mushrooms. That is, each psychoactive experience was found to be, for example, more intense, or less colorful, or more stupefying, or less physically demanding, or more insightful than another. Marijuana serves as a phytochemical parallel, even though it is a nonalkaloid plant. The two main species, Cannabis sativa and C. indica definitely exert different energies on the mind and body, owing to their varying concentrations of tetrahydrocannabinol (THC). Similarly, hallucinogenic mushrooms have different potency levels which affect psychoactivity. The indolic alkaloid content responsible for changes in brain chemistry varies from species to species between 0.2% and 0.6%, and less in dried specimens (Schultes & Hofmann 1979: 79). The auditory, visual, physical and gustatory effects achieved when one species is substituted for another are quite different in intensity and potency. This is the variation hierophants desired. Moreover, the differences in intensity and potency are noticeable even within identical species. Emboden (1979: 162; italics added) supports this view: "The psychopharmacology of mind-altering plants is so complex that a single plant may have multiphasic effects due to its chemistry or according to dosage." Mayer (1977: 34) states that 35 different species of hallucinogenic mushrooms are registered in Mexico, yet he offers no taxonomic verification of their existence or provenience. Furst (1976) refers to an astonishing 57 species utilized, but offers no listing, either. If priestly propaganda had peasants believing that insanity and death were the prices to be exacted for the recreational use of hallucinogenic mushrooms, how did the "usurping hieratic functionaries" get away with their copious indulgences of the fungi? The answer lies in ritual: transcendent ceremonial enactments staged and orchestrated by powerful elitist Mayan theologians. In this standardized set and setting context, Weil (1980: 57) notes that "ritual and ceremony work to minimize the potential of drugs to cause negative experiences." Although police power is not derived from sacred psychoactive plants, consider a form of usurpation, monopoly and control in modern society of certain legal medicinals, crops (e.g., the growing and sale of hops) and drugs (caffeine, nicotine, alcohol, barbiturates, amphetamines, etc.) by conglomerate tobacco and alcohol industries and pharmaceutical companies. The tight controls and restrictions by big business and government serve the pecuniary interests of these elite medical and pharmaceutical professions: their wealth perpetuates power, and ultimately, corruption. Did the downtrodden and oppressed peasants - forever dimly spotlighted against the flashy backdrop of Classic Maya culture - ever finally tire of their situation and rebel? Possibly toward Late Classic times, a period of decadence, corruption and infighting, masses of hungry and angry peasants were mobilized into insurrection. Popular campaigns against established orders in the process of decay and disintegration hardly ever fail, as witnessed again and again in historical parallels. If peasant Mayan farmers and slaves could have united under a leader in a front against their perceived elite oppressors, their undermining and sabotaging tactics, along with other deleterious events, might have contributed to a full-scale toppling of Mayan civilization. Spotting the fruiting bodies of camouflaged fungi in native habitats is a tricky enterprise (Weil 1980: 60,77). If the model of mushroom trade is correct, perhaps experienced and reverent individuals were called on who developed a knack for finding and collecting wild specimens. Perhaps a breed of special, ritual harvesters existed in Mayan social structure to disclose the whereabouts - the econiches - of exotic, potent species of mushrooms. Perhaps a group akin to the elite Pochteca trader class of Aztec society existed. It is probable that the Pochteca handled all transferences of the northern desert peyote cactus; for Dobkin de Rios (1976: 36) states that "it was dried and transported several hundred miles to the south," to Aztec territory. Could a Mayan Pochteca have collected and distributed mushrooms all over Mesoamerica? 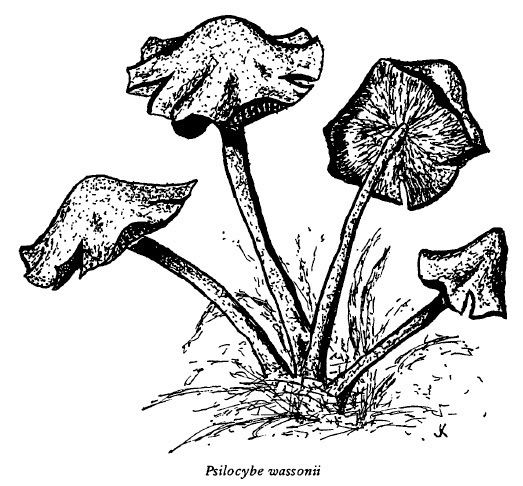 Lowy (1977: 124) has botanically identified Psilocybe mexicana as occurring in Guatemala. Previously known only in Mexico, the discovery of this agaric in southern Mesoamerica raises some questions. Has Psilocybe mexicana always grown locally in Guatemala? If so, its appearance to Western eyes after all these years demonstrates the lacuna in ethnobotanical lore. Or, were spores of Psilocybe mexicana introduced into Guatemala ages ago by traders from Mexico? It should be emphasized that none of these scholars had as a research proposal the documentation of mushroom exchange networks in ancient Mesoamerica. The notion probably never even entered their minds, but their comments about related matters - personal preferences, seasonal and regional availabilities, chemical compositions, residential deities with power-giving qualities and hieratic usurpation of controlled substances - indirectly supported certain claims and premises of the Transcendental Interaction Model. This author does not feel that he has misrepresented words or taken ideas out of context, but rather, has formed an interpretation based on sound inferences and logical extrapolations. It is possible that many trade items were purchased using cacao beans (genus Theobroma) as currency. Sacred mushrooms, though, might have been in a league by themselves. Schultes and Hofmann (1979: 148) report that in present-day Oaxaca, mushrooms are not sold in marketplaces, although it is possible that they are reciprocally exchanged. Contradictory to this, Lowy (1977: 124) reports observing mushrooms for sale. Presumed reciprocal exchange among the ancient Maya might have taken place in a secluded temple or perhaps in the privacy of a special off-limits place. In any case, mushrooms were not necessarily traded expressly for mushrooms. If obliged to present negative evidence against mushroom exchange in prehistoric Mesoamerica, a basic question arises: Why were the Maya never attracted to peyote (genus Lophophora) or morning glories (genera Turbina and Ipomoea) for ritual enhancements? Aztec wizards combined and alternated a multiplicity of mind-altering plants in ceremonies, including the revered Teonanacatl, the mushroom "flesh of the gods." To argue that the cacti were nonlocal, remote commodities (hence, not available for procurement and distribution) is fruitless if the Transcendental Interaction Model has presented a faithful context of long-distance exchange of psychoactive plants. The Maya most likely knew about peyote from lore coming out of western and central Mexico, but evidently they were content with mushrooms and the amazing variety they offered. Besides, it is not as though the Maya restricted themselves to one drug. They also utilized the probably psychoactive water lily (genus Nymphaea), which is seen repeatedly in art motifs; and there is evidence that bufotenine from the common toad contributed to the psychoactive pharmacopoeia employed by the ancient Maya in rites and sacraments (Dobkin de Rios 1976: 45). Gilbert, T.P. 1974. The Lost Civilization: The Story of the Classic Maya. New York: Harper & Row. de Borhegyi, S.F. 1963. Pre-Columbian pottery mushroom stones from Mesoamerica. American Antiquity Vol. 28: 328-338. Dobkin de Rios, M 1976. The Wilderness of Mind: Sacred Plants in Cross-cultural Perspective. Sage Research Papers in the Social Sciences. Beverly Hills, California: Sage. Dobkin de Rios, M 1974. The influence of psychoactive flora and fauna on Maya religion. Current Anthropology Vol. 2(15): 147-164. Dobkin de Rios, M & Smith, D.E. 1976. Using or abusing? An anthropological approach to the study of psychoactive drugs. Journal of Psychedelic Drugs Vol. 8(3): 263-266. Emboden, W.A 1979. Narcotic Plants. New York: Macmillan. Furst, P.T. 1976. Hallucinogens and Culture. San Francisco: Chandler & Sharp. Furst, P.T. 1974. Hallucinogens in pre-Colombian art. In: King, M.E. & Traylor, I.R. (Eds.). Art and Environment in Native America. Lubbock, Texas: Texas Tech Press. Furst, P.T. 1972. Flesh of the Gods: The Ritual Use of Hallucinogens. New York: Praeger. Kidder, A.V. ; Jennings, J.D. & Shook, E.M 1946. Excavations at Kaminaljuyú, Guatemala. Washington, D.C: Carnegie Insti tute. Köhler, U. 1976. Mushrooms, drugs, and potters: A new approach to the function of pre-Columbian Mesoamerican mushroom stones. American Antiquity Vol. 41: 145-153. La Barre, W. 1970. To Find Our Life: The Peyote Hunt of the Huichols of Mexico. Film review. American Anthropologist Vol. 72(5): 1201. Lowy, B. 1977. Hallucinogenic mushrooms in Guatemala. Journal of Psychedelic Drugs Vol. 9(2): 123-125. Mayer, K.H. 1977. The Mushroom Stones of Mesoamerica. Vienna: Friends of Ethnology Society. Parsons, L 1974. Pre-Columbian America: The Art and Archaeology of South, Central, and Middle America. Milwaukee: Milwaukee Public Museum. Polanyi, K. 1975. Traders and trade. In: Sabloff, J.A & Lamberg-Karlovsky, CC (Eds.). Ancient Civilization and Trade. Albuquerque: University of New Mexico Press. Pollock, S.H. 1975. The psilocybin mushroom pandemic. Journal of Psychedelic Drugs Vol. 7(1): 73-84. Plog, F. 1977. Modeling economic exchange. In: Earle, T.K. & Ericson, J.E. (Eds.). Exchange Systems in Prehistory. New York: Academic Press. Rathje, W.L. 1972. Praise the gods and pass the metates: A hypothesis of the development of lowland and rainforest civilization in Mesoamerica. In: Leone, MP. (Ed). Contemporary Archaeology. Carbondale: Southern Illinois University Press. Reichel-Dolmatoff, G. 1971. Amazonian Cosmos: The Sexual and Religious Symbolism of the Tukano Indians. Chicago: University of Chicago Press. Renfrew, C 1977. Alternate models for exchange and spatial distribution. In: Earle, T.K & Ericson, J.E. (Eds.). Exchange Systems in Prehistory. New York: Academic Press. Renfrew, C 1975. Trade as action at a distance: Questions of integration and communication. In: Sabloff, J.A. & Lamberg-Karlovsky, CC (Eds.). Ancient Civilization and Trade. Albuquerque: University of New Mexico Press. Sahlins, M 1972. Stone Age Economics. Chicago: Aldine-Atherton. Schultes, R.E. 1978. Evolution of the identification of the sacred hallucinogenic mushrooms of Mexico. In: Ott, J. & Bigwood, J. (Eds.). Teonanacatl Hallucinogenic Mushrooms of North America. Seattle: Madrona. Schultes, R.E. 1976. Hallucinogenic Plants. New York: Western. Schultes, R.E. & Bright, A 1979. Ancient gold pectorals from Colombia: Mushroom effigies? Botanical Museum Leaflets, Harvard University Vol. 27(5-6): 113-141. Schultes, R.E. & Hofmann, A. 1979. Plants of the Gods: Origins of Hallucinogenic Use. New York: McGraw-Hill. Thomas, D.H. 1974. Predicting the Past. New York: Holt, Rinehart & Winston. Thompson, J.S. 1966. The Rise and Fall of Maya Civilization. Norman: University of Oklahoma Press. Wasson, R.G. 1978. The hallucinogenic fungi of Mexico: An inquiry into the origins of the religious idea among primitive peoples. In: Ott, J. & Bigwood, J. (Eds.). Teonanacatl: Hallucinogenic Mushrooms of North America. Seattle: Madrona. Wasson, R.G. 1971. Notes on the present status of ololiuqui and the other hallucinogens of Mexico. In: Weil, G.M; Metzner, R. & Leary, T. (Eds.). The Psychedelic Reader. New York: Citadel. Wasson, R.G. 1968. Soma: Divine Mushroom of Immortality. New York: Harcourt, Brace & World. Weaver, MP. 1972. The Aztecs, Maya, and Their Predecessors: Archaeology of Mesoamerica. New York: Seminar Press. Weil, AT. 1980. The Marriage of the Sun and Moon: A Quest for Unity in Consciousness. Boston: Houghton Mifflin. Weil, AT. 1972. The Natural Mind: A New Way of Looking at Drugs and the Higher Consciousness. Boston: Houghton Mifflin.